Black lacquer on the vase's surface provides additional protection from various hazards. A box with two clasps on the front for storage and transportation is included. The urn and the box are rather heavy. 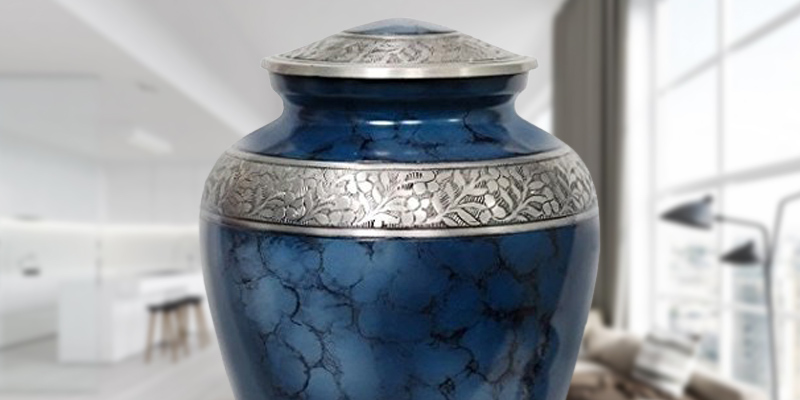 This classic cremation vase has anti-corrosion properties, and thanks to its design, it will definitely find a place at your home or in a columbarium niche. You can place the urn virtually anywhere as its bottom is fitted with felt; no scratches will be left. 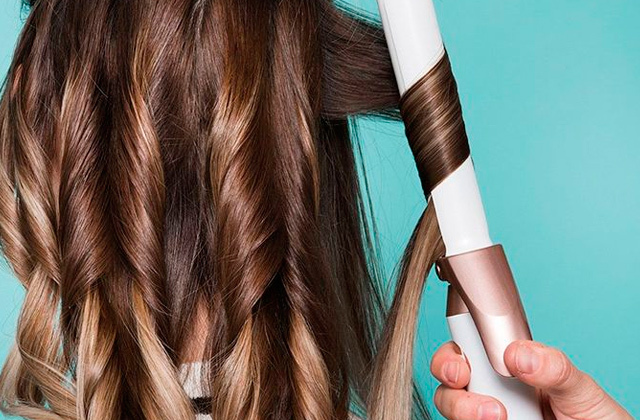 The bag strings might lose their look with time. 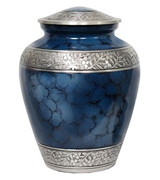 Memorials4u Cremation Urn is all about symbolism, style, and durability. It is a perfect choice if you want to honor the memory of a deceased person in a beautiful way. Sliding opening at the bottom will make the procedure of ashes scattering convenient and neat. The quality of felt pads leaves something to be desired. Beautiful and practical, Bogati Hand Carved cremation urn is fully biodegradable, thus, it is the best model to use for in-ground burial. Purple glass stone pendant with engraved inscription and stainless steel chain make Infinity Keepsakes necklace not only a meaningful but also an elegant piece of jewelry. The wings cover the "Always in my Heart" inscription a bit. 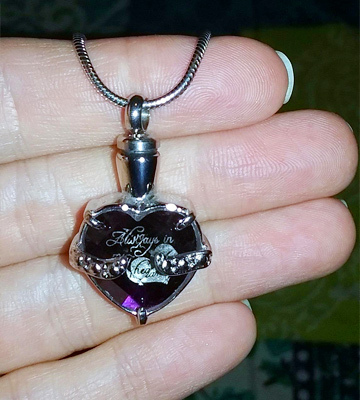 This symbolic pendant will give you a chance to keep meaningful things close to your heart, be it cremated remains, a small amount of hair, a love note, some essential oil, etc. Small amount of ashes, hair, dried flowers, essential oils, etc. Pendant: 0.75" x 1.25" x 0.25"
The pendant is decorated with a rhinestone that adds elegance to this meaningful piece of jewelry. If you want to change the chain, only thin ones will be suitable. This stylish minimalistic bar urn will become a meaningful accessory for you for years thanks to the high quality of the material it is made of. Infinity Keepsakes "Always in my Heart"
Star Legacy Majestic Radiance is a classic cremation vase. Made of brass, it is quite durable to be stored wherever you want, be it your home or a columbarium niche. It will also be convenient to carry out a scattering ceremony using this urn. These options are possible due to 10.4” x 6.1” dimensions of the urn and 3.25” diameter of its lip. One more way to use this urn is to bury it in a memorial garden but keep in mind that its material isn’t biodegradable, so maybe you don’t want to choose this option if you are concerned about the environment. We'd like to point out the sophisticated design of Star Legacy urn, too. Hand-engraved, it will be a beautiful resting place for your deceased beloved. Finally, note that the capacity of this urn is 190 cubic inches, in other words, it is a large-sized model and is suitable for the remains of an adult. Cremation urns are not simple vessels that serve only practical function; more often than not, they have symbolic meaning, and Star Legacy Majestic Radiance isn’t an exception. 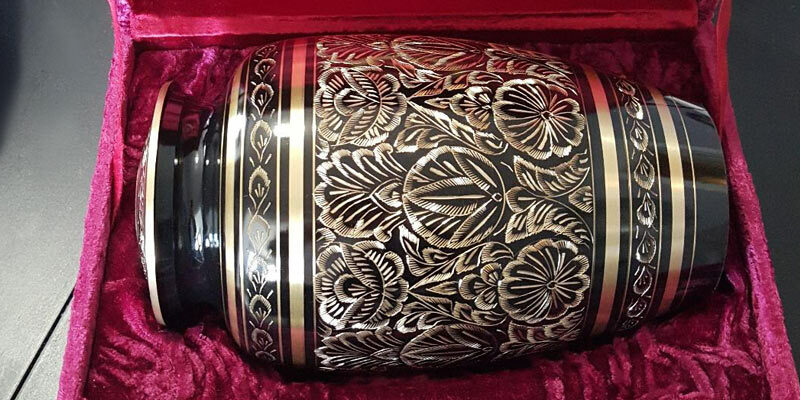 Its smooth shape without edges stands for eternity, and its engraved floral pattern substitutes traditional floral tribute, so the memory of your loved ones will always be honored with flowers engraved on this cremation vessel. If the last will of a deceased person was for you to bury him/her in another state or even country, there are some things you should know about onboard transportation of cremation urns. As well as other things you transport onboard, cremation vessels need to pass security control, including X-ray. If an urn is made of the material that prevents it from passing the procedure, chances are you won’t be allowed to take it onboard. Be ready that aircraft security guards will make sure a vessel doesn’t contain explosive devices or other prohibited items inside. Every airline reserves the right to impose its own requirements on the transportation of cremation urns. Putting it in a wooden box, having a death certificate, forms from a crematorium, and other documents are among common requirements. Star Legacy model is sold in a white cotton bag and a box encased in purple velvet that will definitely come in handy if you need to transport the vessel onboard. 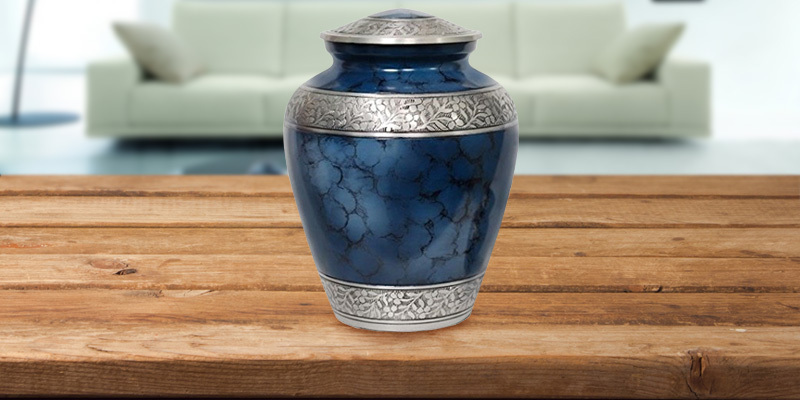 Just like most classic cremation urns, the Memorials4u Elite model is a vase-shaped vessel. 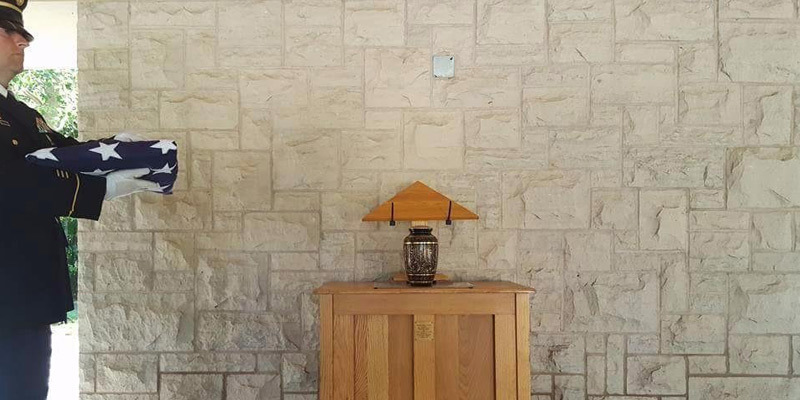 An urn of this type and size (8” x 8” x 11”) will fit in a columbarium niche or find its place in your home if you want to keep the remains there. Wherever you decide to keep the urn with ashes, you can be sure it will look as good as new even years later thanks to aluminum alloy it is made of. 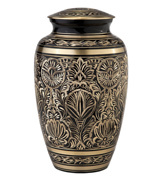 In addition to the great capacity of 200 cubic inches, the urn from Memorials4u is really attractive. Smooth cloud blue texture perfectly blends with three silver bands (on the lid, then on the widest and the narrowest parts of the body) engraved with a floral pattern. The manufacturer has also provided the vase with felt bottom, thus allowing you to protect the surface you will put the urn from scratches. If you want to keep cremains of your deceased relative at home but aren’t sure it’s safe, we’d like to reassure you. Here is a bit of info about cremation procedure. 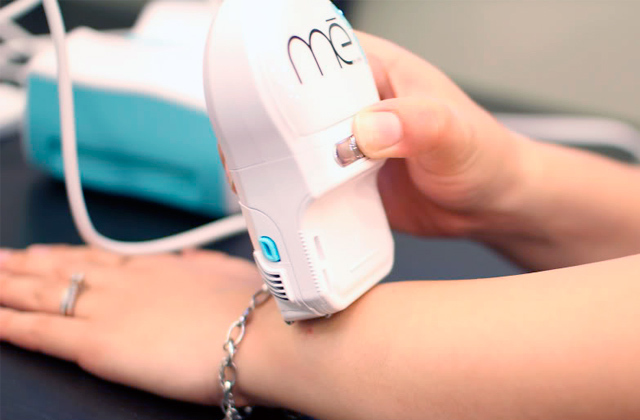 It is carried out at 2000°F (sometimes, even higher) temperature that destroys all organic compounds. As a result, ashes don’t have any odor and don’t produce harmful evaporation. Plus, it was already mentioned that all cremation urns are hermetically sealed, and there’s no need to worry about any detrimental effect of their contents to your health. It might seem awkward but space burial does exist, and what’s more interesting, it is becoming very popular nowadays. The idea of a space burial is to send tiny part of ashes (usually 0.03-0.25 ounces) into Earth orbit. The process resembles spacecraft (with ashes inside) going into orbit to burn. However, two more options are available – if you don’t want ashes to burn in space, it’s possible to send them to other planetary bodies or even far beyond our solar system. 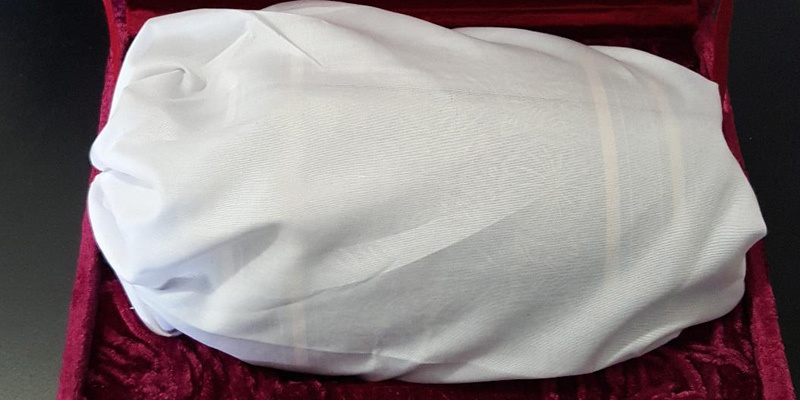 A black soft bag included in the box makes the urn transportation so much more convenient. What to do with cremated remains is a highly private decision made in accordance with the preferences of a dying person and the wishes of his/her relatives. Although the majority of people choose to keep a cremation urn at home or put it in a columbarium, traditional in-ground burial hasn’t gone out of fashion yet. 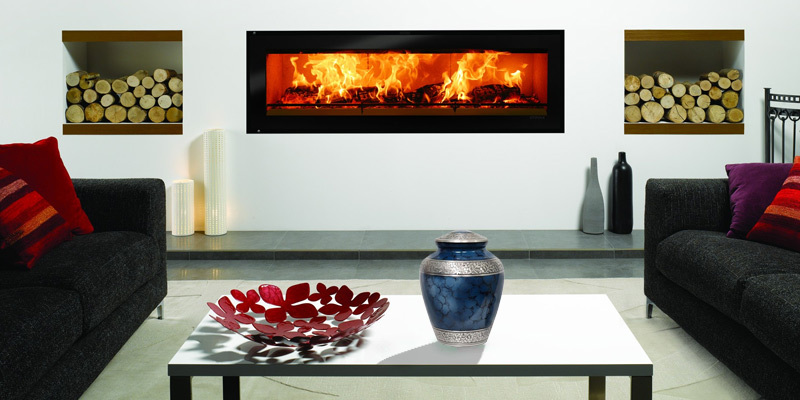 If you’ve decided to lay a deceased person to rest, Bogati Urn will be the best choice. 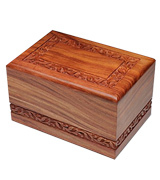 Made of rosewood, the urn is biodegradable and will decompose with time causing no harm to the environment. Besides being an ecological way of burial, Bogati vessel is also beautifully designed. 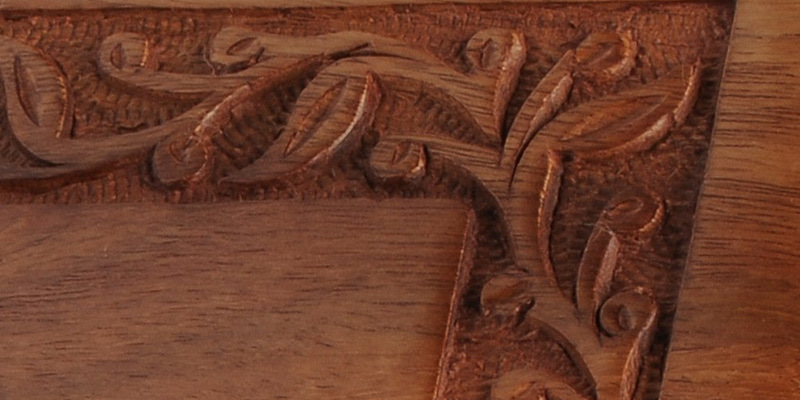 It is a neat box with a carved floral pattern that symbolizes unity with nature. 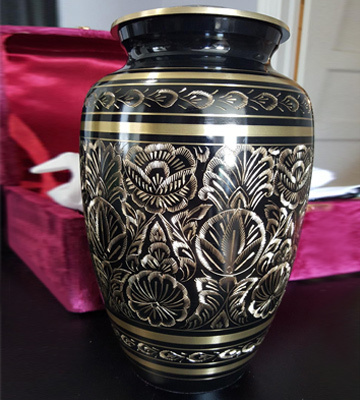 By the way, every detail is carved by hand, and it makes the urn look even more refined and, as a result, it won't look out of place in your home if you decide to keep the cremains as a memory. Finally, Bogati Urn is TSA approved, and you can transport it in any vehicle if need be. 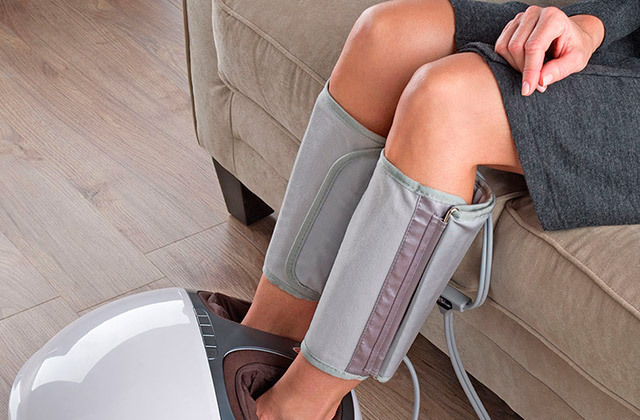 Scattering is one of the most popular ways of ashes disposal after cremation, and there are a lot of options to carry the procedure out. You can scatter ashes of a deceased person in your yard or garden if you want to make this act more personal. It’s also possible to do it in a cemetery, park, forest, or you can strew ashes over a body of water. Aerial scattering is becoming more and more popular, and if you want to disperse ashes from a plane, helicopter, hang glider, or hot air balloon, you’ll definitely find a company that can provide such services. 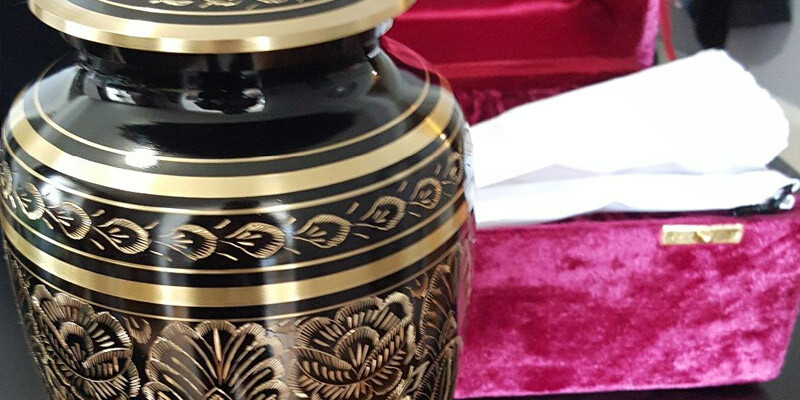 If you’ve decided to scatter the ashes of your loved one, Bogati Cremation Urn will come in handy. With a sliding opening at the bottom, it will give you a chance to dispose of ashes neatly. 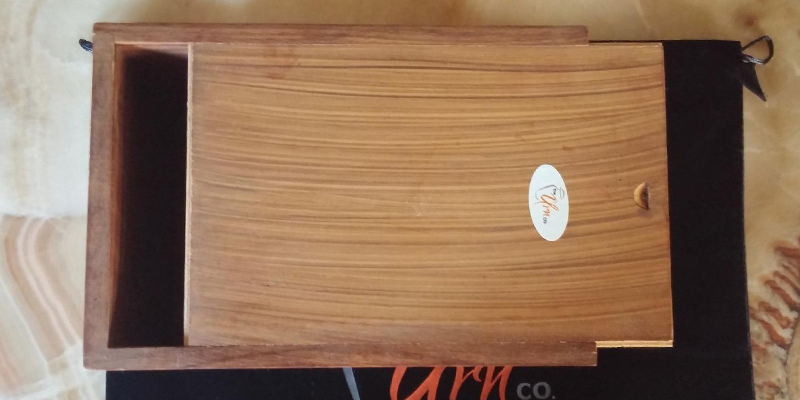 The lid of the box has empty space in the center where you can place a plate with memorial inscriptions that you order from the manufacturer or write on your own using a laser engraver. 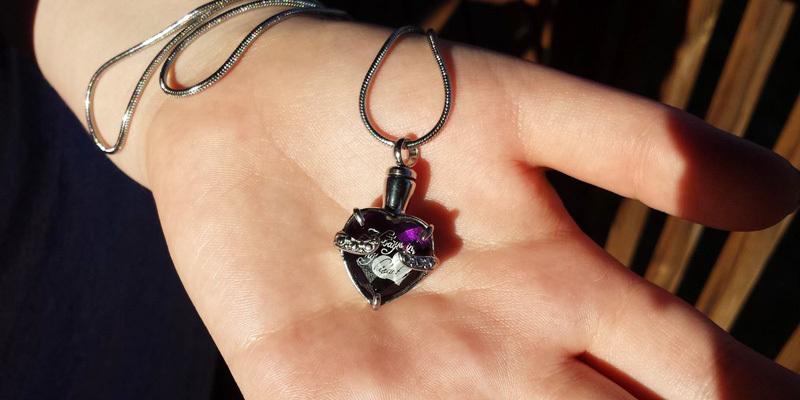 If the loss of someone close affected you so much that you aren’t ready to let them go, maybe carrying a small amount of ashes in a special pendant will help you ease your pain. 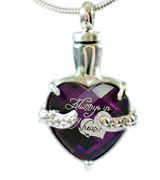 Infinity Keepsakes Cremation Urn Necklace is a heart-shaped glass pendant with an “Always in my Heart” inscription. And wings on both sides of the heart add even more meaning to this small piece of jewelry. In addition to the symbolism Infinity Keepsakes Necklace embodies, it also offers great quality. The inscription is engraved inside the glass so it will never lose its look. Plus, 18-inch stainless steel chain included in the box features a snake weaving pattern ensuring durability for years. 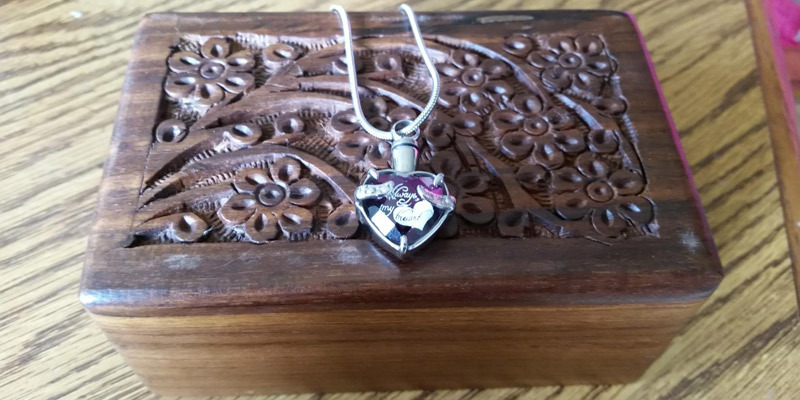 We dare assume if you’re going to choose cremation jewelry among other cremation vessels, you’d like it to be hermetically sealed, and Infinity Keepsakes model is just like that. 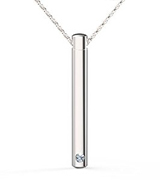 The pendant is equipped with a threaded screw top to keep ashes inside securely. Take notice of chain hook – it is quite sturdy and won’t let the chain open incidentally. You’ll also be pleased with a fill kit provided by the manufacturer: a small funnel and a poker to help you fill the pendant with ashes neatly and easily. Lastly, don’t overlook small black bag where you can transport and store your Infinity Keepsake Cremation Jewelry when not in use. 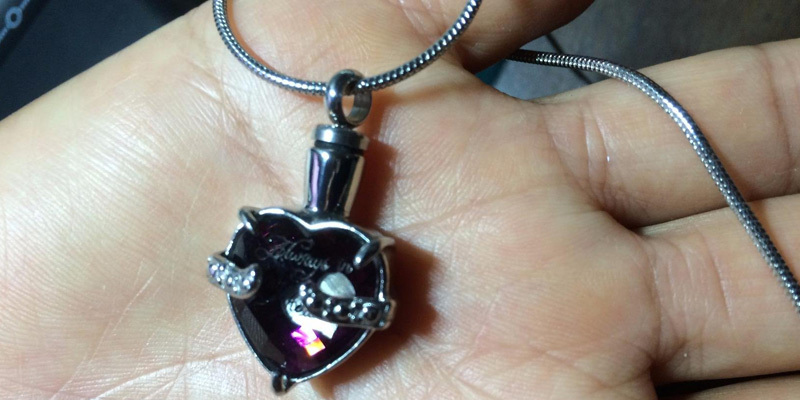 The beauty of Infinity Keepsakes necklace is that it’s suitable not only for storing ashes. You can use it for keeping other meaningful substances. The capacity of this pendant is enough to place a small amount of your baby’s hair, a bit of your homeland soil, a tiny love note, or any other thing that means a lot to you. Infinity Keepsakes Necklace can be called a truly universal piece of jewelry. 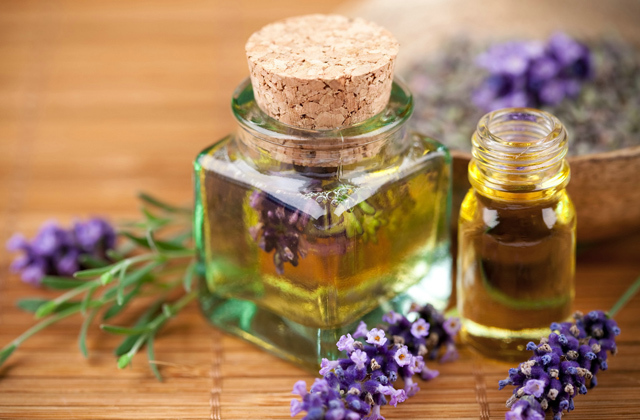 Besides all the application options mentioned above, it can be used for keeping essential oils. 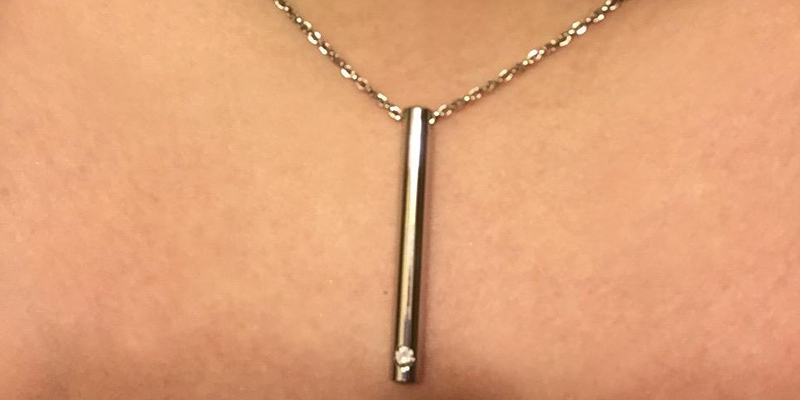 Using the pendant this way, you’ll have a chance to enjoy your favorite aroma wherever you go. 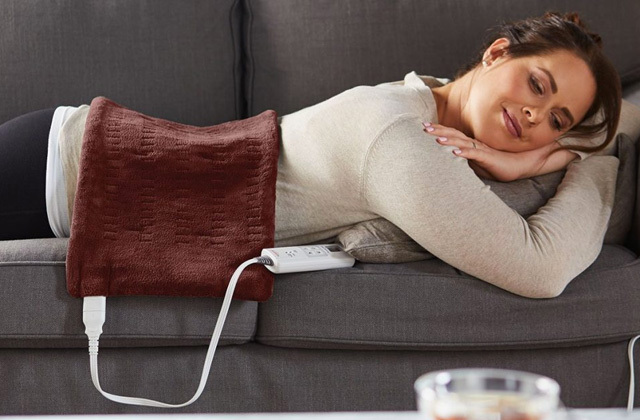 And inhaling essential oils that boast therapeutic effect, you’ll be able to recover faster if you catch a cold. RICHKING model is a small pendant where you can keep ashes of your loved person or a pet close to your heart after their death. However, what differs this model from other pendants is its modern design. Made of stainless steel, it looks simple yet stylish, and will perfectly blend with any look, be it casual wardrobe or evening wear. Stainless steel also adds to the durability of the pendant by preventing it from tarnish, rust, stains, and other damage. Take notice of the screw-top lid too as it ensures proper storage of any substance you keep inside the pendant, from ashes to essential oils. Also, RICHKING cremation jewelry is sold with a fill kit that makes its use really convenient. If you think that sending ashes to space is the craziest way of burial, you’re probably mistaken. People have found a lot of ways to honor the memory of their loved ones that can hardly be called traditional. 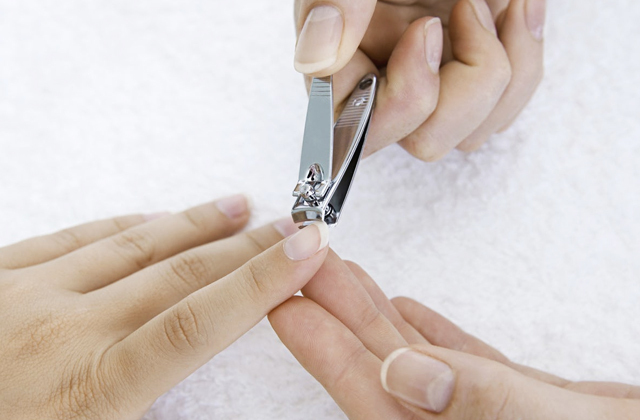 For example, it’s possible to add a small amount of ashes into a synthetic diamond that can be inserted into a piece of jewelry later. You can also add ashes to paint and create a picture that associates with a deceased person or a pet. Some people add ashes of their loved ones into ink when they make tattoos. Why, even mixing ashes with cement to build an artificial reef has been registered. So if you feel like you want to honor your loved person unusually, you can think of your own way of ashes disposal. The shape of the RICHKING pendant is very symbolic since it resembles a “one” figure and you can interpret its meaning in numerous ways. It can mean “Only One”, “Irreplaceable”, or any other message that is significant to you. 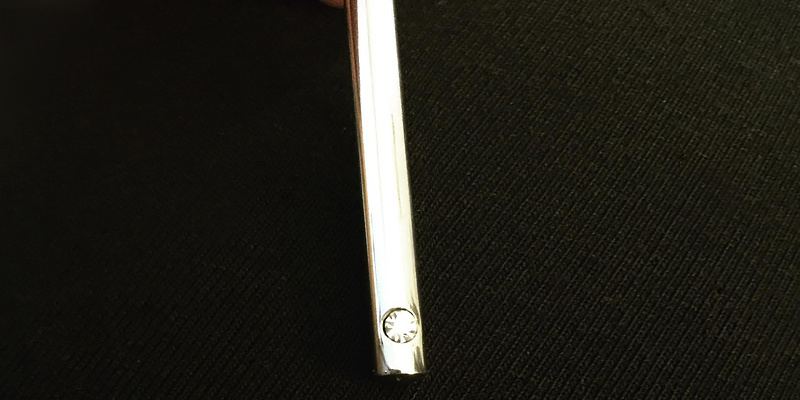 If you take a closer look at the RICHKING Minimalist Bar Urn, you’ll notice it’s encrusted with a rhinestone that looks like a real diamond. 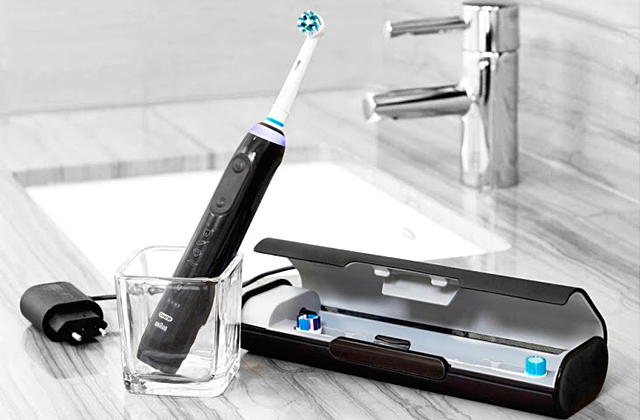 Moreover, it even shines like a precious stone thanks to its great ability to reflect light beams. 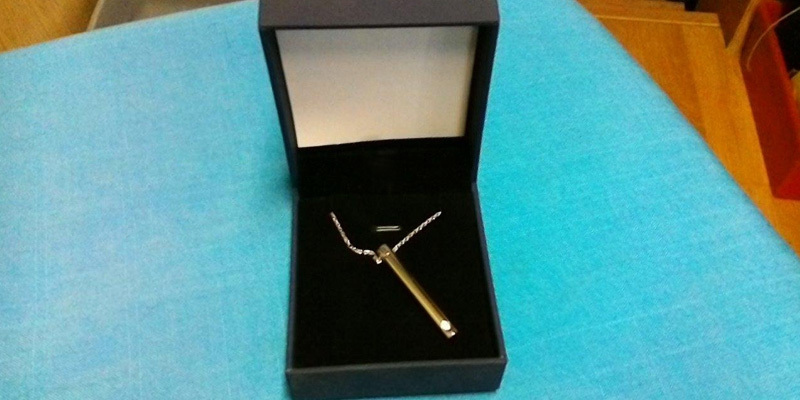 Choosing this cremation urn, you get an attractive and meaningful piece of jewelry for personal use or for a present. Cremation is considered to be a more ecological and economical way of burial, that’s why it is becoming more and more popular nowadays. 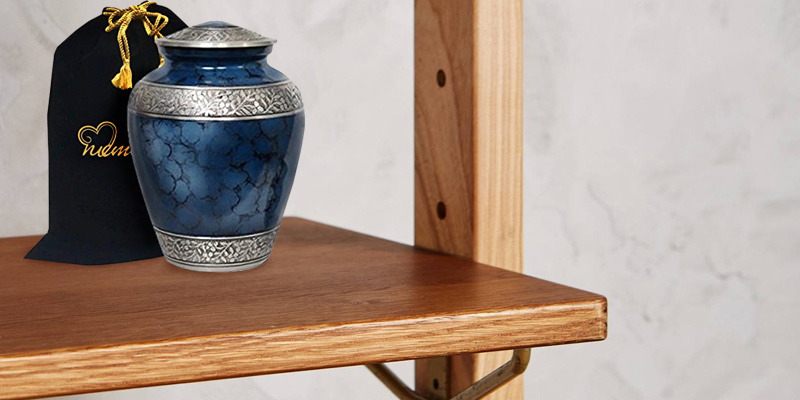 If it happened so you have to handle a cremation procedure, you will definitely need a cremation urn, a special vessel for storing the deceased person’s remains. Cremation vessels have a wide range of applications and can be buried in a memorial garden, kept in a columbarium, or stored at home. They also come in handy if you need to scatter ashes. It’s easy to get lost in a great number of models represented on the market: from the simplest box-shaped models to sophisticated urns with engraved inscriptions. To save you the trouble of surfing the Internet for hours looking for a suitable cremation container, we’ve picked five best models that might interest you. 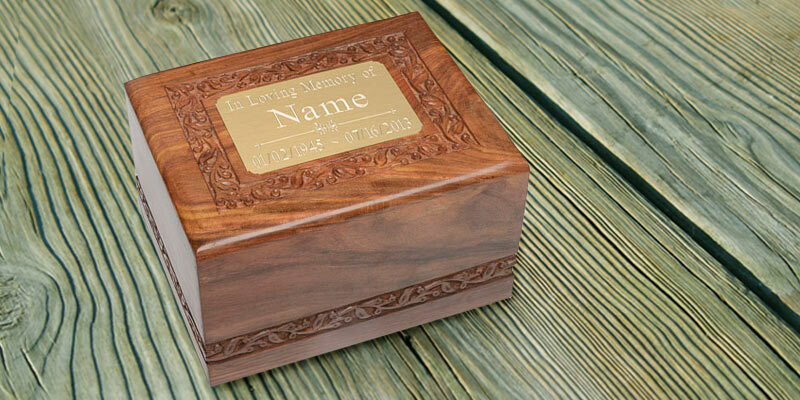 Type and Capacity of a cremation urn are among the first features that should be taken into account before you make a choice. 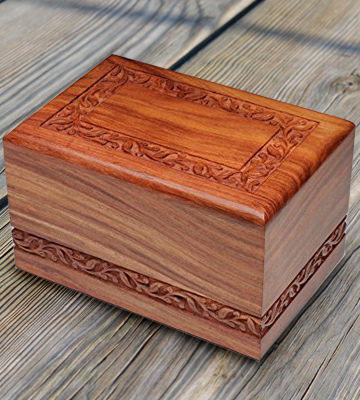 According to their shape and purpose, cremation vessels can be divided into classic urns (in the shape of vases), boxes, and cremation jewelry. As for the urn’s capacity, you want to be aware of one rule – 1 pound of body weight before cremation is 1 cubic inch of a vessel. So, if a person weighed 200 pounds during the lifetime, you’ll need to choose the urn of 200-cubic inch capacity. 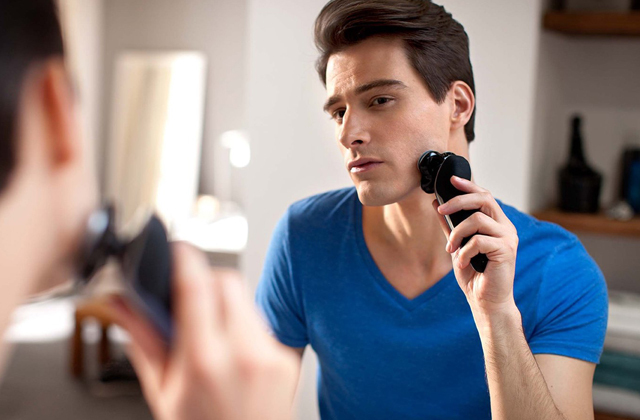 Sometimes, manufacturers mark their products as Adult/Large or Child/Infant to help you choose the right size. Resting place and Material should be considered together since they depend on each other. If you’ve decided to bury your loved one in a cemetery, a wooden urn is the best choice as it biodegrades in time causing no harm to nature. Metal, porcelain, glass, and brass vases are equally good to be stored in a columbarium for years. Finally, if you want ashes of your close deceased person to remain at your home, choose the material that will blend with the interior of your apartment. The last but not the least thing to take into account is the Features of an urn that make its use convenient. All cremation containers are hermetically sealed thanks to threaded lids or secure closures (depends on a model), so no matter which one you buy, you can be sure ashes are kept inside an urn securely. When looking for cremation jewelry, pay attention to extras such as funnel and poker that enable you to put ashes inside the vessel neatly. If you set your eyes on a pendant, the length of its chain plays quite a role too as it determines the comfort of wearing. Lastly, storage bags add greatly to the usability of an urn. Q: Are there specific regulations on cremated remains scattering? A: Although scattering ashes is allowed in the USA, there are some rules regarding the public order you have to follow. 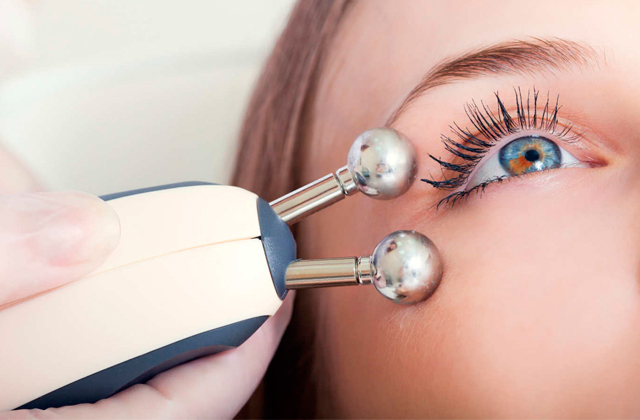 The easiest way to carry out the procedure is to do it in your own yard where no one can limit your actions. However, if you rent a house, you should ask your landlord for permission first. As for the scattering rules in public places such as parks, woods, water bodies, they vary from state to state, and you’ll need to consult your local authorities in order to not violate them. Q: Are cremation pendants waterproof? A: Actually, the manufacturers of cremation jewelry don’t usually give information on waterproof features of their products. But taking into account the available information, one can assume that they are. 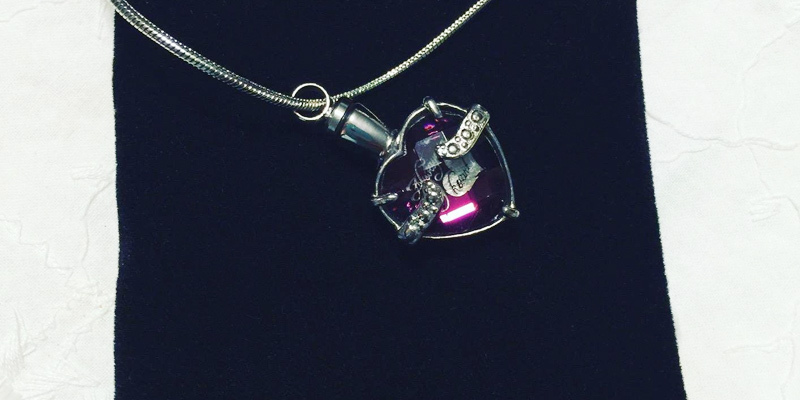 As a rule, pendants are made from glass or stainless steel and feature hermetically sealed tops that prevent ashes from escaping from the vessel. But if you’re afraid to lose or damage a piece of cremation jewelry, it’s better to keep it far from water. Q: Is it possible to bury a cremation urn? 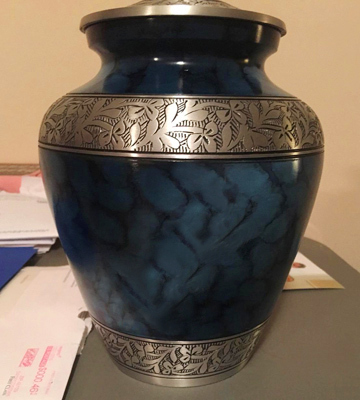 Is any urn suitable for in-ground burial? A: There are special memorial gardens where cremation urns can be buried. If you’ve decided to entomb an urn with ashes in the ground, it’s recommended to choose biodegradable models, for example, wooden ones that won’t harm the environment after decomposition. 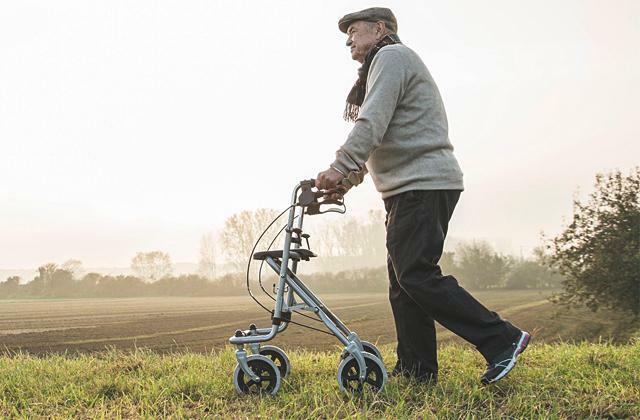 Keep in mind that some memorial gardens can set special rules concerning urns that can be buried, so it’s better to consult the management of a garden in advance. Q: What is a temporary cremation urn? A: Temporary cremation urns are cheap paper or plastic containers (usually made in the shape of boxes) that are used in crematoriums. Crematorium workers put cremains there after the ceremony and give these containers to relatives of a deceased person. 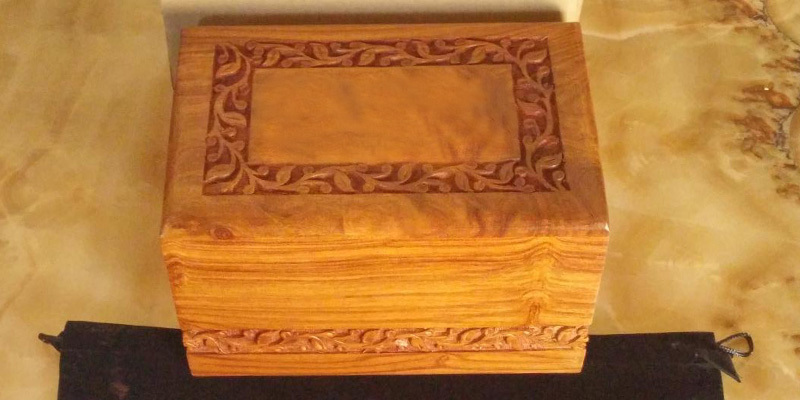 Q: How do I transfer cremains from a temporary urn to a permanent one on my own? A: To transfer ashes neatly, you’ll need a funnel and a poker or some other things that can perform similar functions. If you’ve chosen cremation jewelry, it is usually sold with a fill kit that saves you the trouble of buying these items additionally. If you aren’t sure you can transfer ashes without scattering them, you can ask the workers of the crematorium for help, and they’ll do it in a couple of minutes. 1. Urn, Wikipedia. April 10, 2017. 2. All You Need To Know About Cremation, Everplans. 3. Michelle Kim How Cremation Works, HowStuffWorks. 4. Macrina Cooper-White Cremation Is More Popular Than Ever, And Here’s Why (INFOGRAPHIC), TheHuffingtonPost. August 14, 2014. 5. 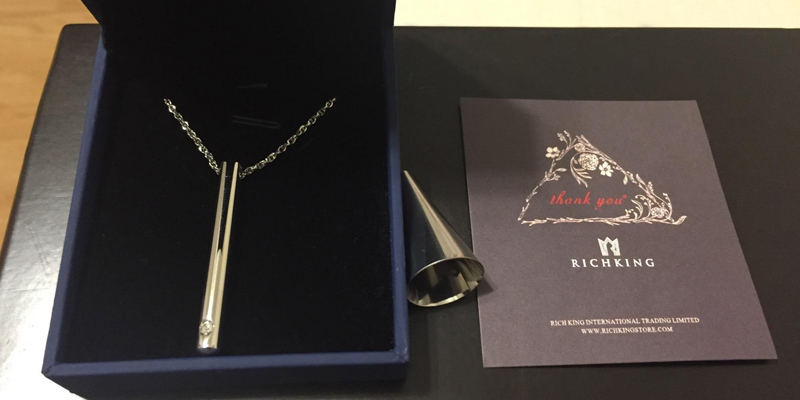 Sam Rega People are turning their deceased loved ones' remains into jewelry — and it's gorgeous, Business Insider. May 28, 2015. 6. How to Choose a Cremation Urn, Slide Share. April 16, 2015.